There's nothing like a rainy morning. 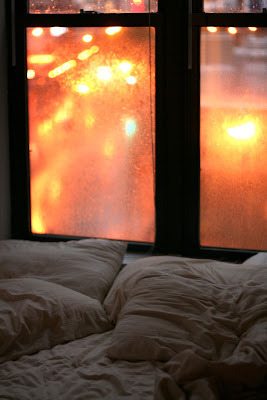 This morning, I woke up to thunder and lightning outside my window and wished I could stay in our cozy bed all day. Mornings are my favorite part of the day. God has made everything new and there is a sacred peace in the morning that can't be found in daytime or evening hours. Unfortunately for me, I can't share this part of day with my sweet husband as he is already out the door just after 5:00am. 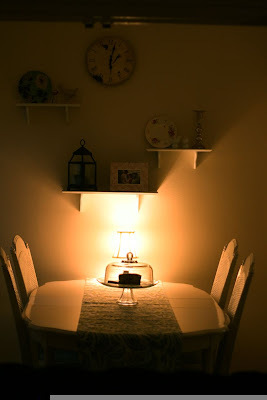 But when I come out of my warm bed and into our kitchen, the only thing lit is the lamp on the table and it's as if Jesus himself is sitting at our table, welcoming me to another day. I'm thankful for a peaceful home, even in the heart of the city. My mom taught me, by example, the importance of your home being a true sanctuary - a place that you and others can come to rest. I'm not totally there yet, but I love when people comment, "I feel so relaxed here." That's exactly what we hope for. 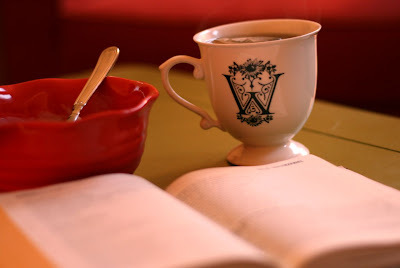 On a typical morning, I'll turn on some Fernando Ortega music, boil tea, grab a piece of whatever is on the cake plate, light a candle, and open my Bible. It's one of the only ways I can start my day out right. This morning, I read Revelation 21, one of my favorite passages, in the Message. It is so encouraging to remember the end of the story - that victory will come, though it seems far off and unlikely at times. I saw Heaven and earth new-created. Gone the first Heaven, gone the first earth, gone the sea. I saw Holy Jerusalem, new-created, descending resplendent out of Heaven, as ready for God as a bride for her husband. I hope and pray your morning has been one of peace. Beautiful Whit! I need to start my mornings out with scripture too! I don't make the time for it like I should!